To be in a countryside amongst green fields, inhaling unpolluted crisp air, soaking the sight of birds flight, the planting of the saplings in a symmetrical and linear fashion by the farmers, sickling the harvest, the threshing, the tractors on the field or the ploughing cattle, the water pumpsets and the wells – all these and much more are a sight to behold and theraupetic for souls like me who are born, bred and live in neon drenched cities. Watching these people at work is so relaxing. This has been my favorite pastime when we travel the countryside. But I have gradually seen all these dwindling with each passing year of late. During my recent trip to Thanjavur which is hailed as the ‘Granary of south India’, it was really disheartening to see many fields turn into residential plots. The farmers who rely on rains are unable to keep up their harvest. Many of them buckling to repay their loans sell their farmlands and land in the city footpaths . It is also in the news how the farmers end up selling sugarcane juice and do other sundry jobs in city platforms to eke a living. Especially, with the water table receding with each passing year and the rivers also running dry, the rivers beds are also mined for sand to build castles for the rich in the cities. At this rate, the gen next may see villages in pictures as all the river beds and farmlands turn into concrete jungle. Not just that it might even prove Thomas Malthus words right about food scarcity. The starting point for the vicious circle is deforestation, I believe. The clearing of trees leads to less rainfall which in turn leads to famine. Here , I like to draw attention to an inspiring selfless couple who are like an oasis in a desert. Chikkanna of Hulikal village in Karnataka got married to Thimmakka of Gubbi town some 75 years ago. They were landless labourers who were not destined for parenthood for which they were taunted and teased at. Added to this was the stammer of Chikkanna which the villagers made fun of by nicknaming as ‘Bikkulu’ Chikkanna. In our country, it is no news how even in educated and the so called elite community, couples without children are cursed. There was pressure on Chikkanna from his folks to get remarried again. But he refused and kept thinking about doing something in life. So one day some 50 years ago, The couple decided to plant trees. Nothing great as most of us have done it in our schools/colleges or even in gardens or as part of ‘Vanamahotsava’. But this couple chose a high way between Hulikal and Kudur(Bangalore-nelamangala route). This was a regular route which most of his village men walked to reach the 4kms to Kudur but most of them dreaded this route since it was dry and sunny. They decided it would be nice if they were to walk under a canopy of trees which shaded the 4 kms. Together the couple put their thoughts to work by quietly raising baby banyan saplings in a nursery which was abundant in their neighbourhood. They then planted them far apart across the road but close between the rows. This foresighted planning has helped the highway road planners to lay a highway between the columns without having to cut a single tree. Chikkanna then built tree guards out of thorns to shield the saplings from goats and other animals. They religiously watered everyday, then every three days/week and later every week until they were ten years old and sustained on their own. Thimmakka carried a pot on her head and another on her hip while chikkanna carried on two pots hanging from the ends of pole over his shoulder. They refilled wherever they found water holes like ponds, wells enroute. Initially they planted 15-20 new plants every year until they covered the 4km stretch between Hulikal and Kudur. These were their children. Chikkanna quit his meager waged job to shield the plants and water them while his wife kept the home fires burning. This selfless service to the society and planet in large was recognized when they were awarded the national citizens award in 1995, five years after Chikkanna’s death. The United States of America has also recognized their work and named a LA based environmental organization after her. Many of us in our day to day life are more concerned about ourselves, perhaps people like this couple are a gentle reminder for us to remind us of our duty towards the environment and society. It is time for us to spread awareness about such unsung Indians who add value to the life of others and inspire others to action. Perhaps, afforestation activities like these can increase rainfall, raise water table and inturn put the farmers back on their path. This post is my contribution to the indiblogger's "ISB idiya contest for change." Wonderful post about two great Indians. Thimmakka amma, we salute you. neither....heard about them and so thought of sharing since they are inspiring. I feel so inspired by reading this post.. 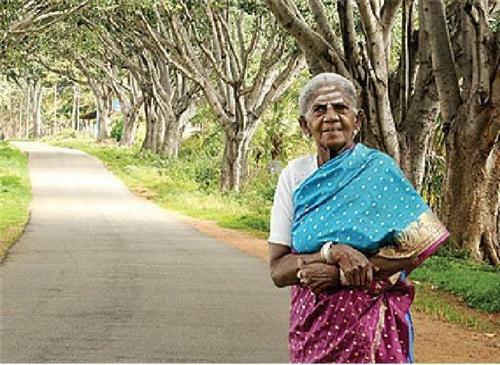 Salute to both Chikkanna and Thimmakka. Nice to see you here, DT. Thank you.